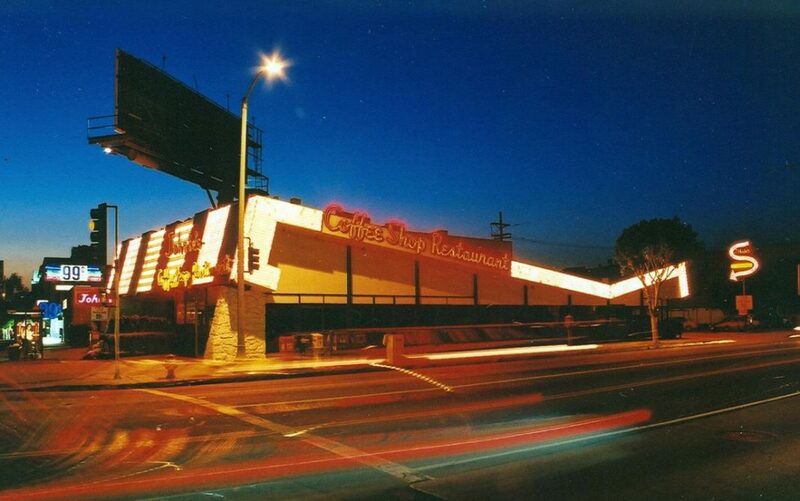 When the Los Angeles Conservancy Modern Committee started working to preserve mid century buildings 30 years ago, the thought that a flat roofed house or a Googie coffee shop (like Johnie’s, pictured) becoming a landmark was laughable. At best it was seen a strange footnote to architectural history that appealed to a fringe audience. Today, every preservation group in the country seems to have a version of the ModCom, and the ongoing rediscovery and resurgence of modern design has lasted longer than the real thing. On Saturday, the group (I am a former chairman) celebrates the occasion with 30/30 Vision, an anniversary party at the concrete brutalist Pasadena Presbyterian church. Meet original architects who have won the Modern Master award, the passionate volunteers that work to save their buildings, and see rare photos and video of your favorite 1950s, ’60s, and ’70s landmarks. Two new documentaries explore the lives of artists who made their name in the Inland Empire when it was mostly orange groves. John Svenson and Millard Sheets spent decades nurturing an artistic community that ultimately made Claremont a hub of Mid-20th century design. If you’ve ever been to one of those white marble Chase banks, you’re familiar with the work of Millard Sheets (1907-1989). The film Design For Modern Living shows how his paintings, mosaic, and stained glass designs influenced generations of artists in the Pomona Valley and beyond. His paintings hang in the homes of wealthy collectors, but his work for Home Savings (now Chase) turned boring banks into a glamorous public art gallery anyone can enjoy. John Svenson was one of his collaborators on the banks and, at age 92, continues to create smooth and beautiful modernist sculpture. The film John Svenson: For The Love of Wood is available on Vimeo. Next articleThree Issues of Los Angeles Magazine Have Been Nominated for ASME’s Reader’s Choice Cover Contest!